Winter can get long here in the North. I begin missing my flowers in Fall, but I’ glad that I am still able to enjoy the outdoors. Once winter has set in, I get a little bummed and a bit stir crazy. Do you? We NEED flowers during these cold & dreary days. Flowers can bring such a smile to my face and to my heart! The variety, the color- can make anyone feel a bit better. Isn’t this why we give flowers for: Birthdays, Anniversaries, Funerals, and other special events? So what are we hopeless gardeners to do? Purchase cut flowers regularly from a florist ($$) ? Force flower bulbs? Buy and care for tropical plants that will flower indoors in the winter? I am a decent gardener outside, but when it comes to plants/flowers for indoors- I can barely just keep them alive. I did some forcing of bulbs last winter with some success. I scheduled the weeks to chill in our company’s cooler and then planted them. Unless you own an extra refrigerator at home, you are can be quite limited on how many bulbs you can manage to chill for 12-15 weeks (the amount of time most fall planted bulbs – tulips, hyacinth, daffodils, crocus, etc – require before they will grow & bloom). Again, this leaves us gardeners in dreary times. Right now (October – December), you can buy Amaryllis and Paperwhites, and they need NO chilling period. Just plant. In 4-8 weeks you will have multiple blooms. Buy a handful, and plant them a week apart for an extended bloomtime! For more variety or for after Amaryllis & Paperwhites, purchase (December & January) prepared or chilled bulbs. Prepared bulbs have been chilled for at least 10 weeks for you. Leaving you to only chill them for 2-5 more weeks. Fully chilled bulbs will be ready for you to plant. In 2-3 weeks you will begin to have more flowers! Stagger planting time to prolong your time period of blooms. 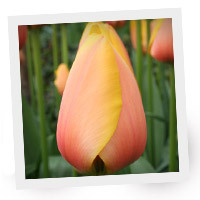 This year, you can find some choices of prepared and fully chilled bulbs at TulipWorld.com and at WillardandMay.com. Here’s to a more cheery winter for all of us gardeners! Well, it is Thanksgiving week! A time to reflect and to give thanks for what we have or have had. And, of course, EAT! Oh, wait- or is it time to shop, shop, shop? Can’t it be both? Are we not capable of multitasking, especially over a period of days?? I am not one to give up sleep for shopping for any gift or for anything really. But, if you want to- go for it! I am sure you will be enjoying some Thanksgiving feast as well. I am super frugal and love a good deal. So, I will be looking online for those deals this weekend too. I am Thankful for the SUN shining, FOOD to eat, a warm HOME to sleep in at night, multiple CLOTHES & SHOES to wear, and so many, many more blessings that I constantly have. I AM BLESSED. Don’t take any of it for granted. Happy Thanksgiving! PS Check out some great deals/gifts at Willard & May & Tulip World this weekend! I get many calls and emails from people in the South: California, Arizona, Texas, Florida, Louisiana, Arkansas, Georgia, Alabama, New Mexico, Oklahoma,Tennessee, North and South Carolina, and Mississippi wondering if they could get any Fall planting bulbs to grow in their warm climate. These warm states have USDA planting zones 7-10. Many Fall planting bulbs (Spring Blooming) need a cold period (weeks at 30° and lower) to grow properly when Spring arrives. This is why many people in our southern states do not get to enjoy Tulips, Hyacinths, Scilla or Crocus growing in their gardens. Though they can, if they use a technique called ‘forcing’. There are a handful of Fall planting bulbs that do NOT need to have a cold period that do well in zones 7-10: Anemones, Ranunculus, some Narcissus (daffodils),* Dutch Iris (not for zone10), Spider Lily or Magic Lily, Amaryllis, and Paperwhites. These would be the easiest gardening choices with no worries of not having enough weeks of cold. 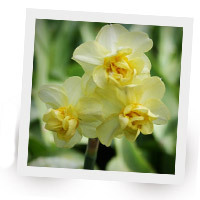 *All narcissus will not do well in every climate, though most daffodils will have a hardiness zone of 3-8. Some will want more sun than others, and some can tolerate more water than others. Daffodils originated from the Mediterranean Mountains. Some were from the side of the mountain, some came from the top of the mountains, some came from the cool and damp low areas. The Narcissus types that need little to no cold(zones 8-9) would be the Jonquils and Tazettas, that also happen to be quite fragrant. Tazettas came from alongside the streams and coastline, and the Jonquils came from lower elevation with very dry summers. 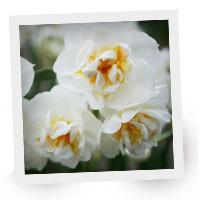 So pick Jonquils if you have the hot dry summers, and pick the Tazettas if you have hot and humid summers (up to zone 9a). It seems Carlton, Thalia and Tete A Tete do great in hot and humid summers as well. Ignore the Pink and double daffodils for the hot South. There is no daffodil that will stay happy in zone 10. Don’t you love finding a new flower to add to your garden? Or at least seeing a new flower you haven’t seen before!?! I love that there are so many variations in height, color, fullness, details in the blooms…the list goes on and on. Planting a new addition in your garden is even more exciting when it’s one you’ve never seen before! I think it is fun and keeps my garden interesting by adding new flowers every year. I finally chose to add a flower bulb to my garden last year that I had seen numerous times before but never actually planted in my own yard. 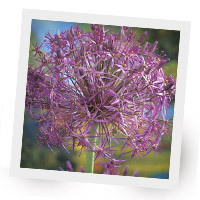 Last fall I added the Allium Shubertii, and I was so thrilled this June when they appeared! It was so much cooler than the pictures! P.S. Always read the description before you buy! Will I get all 4? Probably! What do you think of my choices? Have you been looking for something new and interesting to add to your garden? Naturalizing or Multiplying Plants are the Bomb! Who doesn’t like a good deal or great value? If you know me at all, you know that I am about as frugal as they come! That is why plants (particularly flowers) that naturalize are the bomb! (That slang term must show my age…) No matter what price you pay for them, within reason of course, you are getting a great value! You buy a bag of 5 bulbs or 1 plant, but each year you magically have more! How awesome is that?! About.com gives the definition of naturalized plants as: Plants established as a part of the flora of a locale other than their place of origin. When a plant naturalizes in an area, this can be either a “good” or a “bad” thing, depending on your opinion of the particular naturalized plant. If I buy it, it is a “good” thing. When they appear on their own it is usually a “bad” thing, because they are weeds! When looking to purchase new flowers for my garden, I look to see if it lists naturalizing on the tag. If it is a flower I do not have and it naturalizes, I will buy it. No matter the cost. I plant them in a space that allows them room to grow. Certain flowers will eventually fill that space up. When this happens, I dig some up and plant them in another space or give them to a neighbor! I highly suggest you be on the lookout for the plants that come with this extra bonus… Naturalizing! 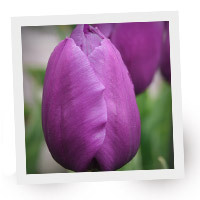 Some Naturalizing flower bulbs include: (as long as you live in their Hardiness zone): Grape Hyacinths (Muscari), Species or Botanical Tulips, Daffodils, Snow Drops, Chinodoxa, Anemone blanda, Iris, Scilla, Puschkinia, Allium, Asiatic Lilies, Oxalis, and Liatris. Some Naturalizing perennial flowers include: (as long as you live in their Hardiness zone): Ferns, Daylilies, Coneflowers, Daisies, Toad Lilies, Phlox, Columbine, Turtlehead, Bee Balm or Monarda, Coreopsis, Poppies, and many Geraniums. So why not try some natural multipliers?! You’ll save yourself time and money and have a beautiful yard to boot! Anemones, Crocus, Muscari, Scilla, Chionodoxa and Galanthus! These all produce great mini flowers that make them perfectly suited for planting under or in front of tulips, daffodils, shrubs or along a woodland border. They all grow just 3″ to 12″ in height. All of these bulb varieties are to be planted in the fall. Some of them are also deer resistant and most are hardy (comes back each year) in garden zones 3-8. 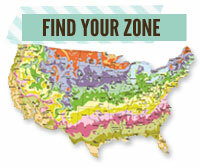 To find your zone click here and then just enter your zip code. Anemone: These bulbs grow with lots of colorful petals on each bloom, resembling small daises or poppies. Depending on the species, some anemones are hardy in garden zones 4-9 (sold in spring) and some in garden zones 7-10 (being sold in fall). Planting tip: Anemone bulbs grow with an extremely hard outer shell. Encourage sprouting and root growth by soaking bulbs in water for 24 hours or overnight prior to planting. Crocus: One of the first signs of spring, these gems bloom extremely early in spring – sometimes when there is still snow on the ground! They provide great bursts of color in partial shade to full sun areas. These short plants (2-6” tall) multiply readily, returning year after year in garden zones 3 to 8. 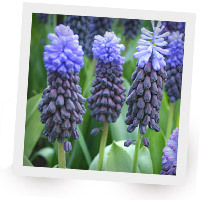 Muscari: These extremely easy to grow bulbs bloom in early to late spring, depending on the species. Their lovely blooms range in color from blue, purple, to white. Great for naturalizing along the edges of wooded areas! They are great for forcing, growing in containers and last just as long as a cut flower as they do in the garden (up to 4 weeks)! Blue Armeniacum is most common and grow 4-8″ tall. They also send up fresh foliage in fall, a nice added benefit. Scilla: The electric blue flowers of the Scilla Siberica (also called “squill) peak bloom in early spring. Scilla are quite easy to grow and easily multiply which make them great for naturalizing! Most varieties grow in the 6-12” tall range. Scilla Campanulata comes in pink, white and blue. Striped Squill (Puschkinia) grow in tiny flower bunches, each petal bearing a beautiful blue stripe. These are all hardy in garden zones 3-8. Chionodoxa: These plants are most effective when used in large groupings under deciduous trees and in front of early-flowering shrubs. Though short-stemmed, they live long in cut flower arrangements. Grown in either in sun or dappled shade, they will flower everywhere. They grow 2-4″ tall. Galanthus: One of the first to appear in winter, these flower are appropriately often called Snow drops. 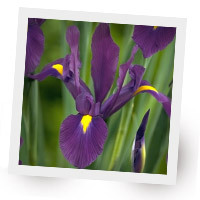 Naturalizes extremely well, they grow approximately 4-8″ tall. 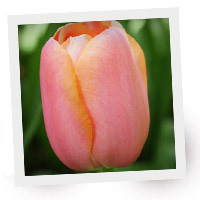 Don’t just settle for Tulips and Daffodils for spring! Add more dimension and color with these low growing delights! Here are some images for inspiration on how to transform your yard into a dream. Fall is a great time to work in the yard because of the cooler temperature you will not have to worry about overheating! It is also a great time for dividing many of your spring blooming bulbs and summer flowering perennials. As Autumn approaches many flowers are done blooming, you may feel your garden is looking a little dull. By dividing and adding new bulbs and perennials, you will have something to look forward to next spring! Cloudy days work best, so you can work as slow as you like. Then the roots will not dry out. Cut back perennials before digging them out. When diving perennials dig up the entire root ball and then split it with shovel or sharp spade. When dividing bulbs dig up the entire bulb area. If you accidently cut into any of the bulbs, you may discard the cut bulbs. Brush off as much dirt clumps as possible, so that you can separate each bulb. Now you are ready to replant your bulbs or perennials, plant at the proper depth in well-draining soil and after re-planting be sure to provide enough water until it thoroughly soaks through the soil. It is never too early to start planning where you can easily add some flowers. 🙂 And don’t forget to share the extras with your friends or to bless someone you know who appreciates flowers too. Does it really matter what size a flower bulb is? Wouldn’t the most bulbs for the least amount of money be the best deal? Bulb size does matter. It takes years for those bulbs to get bigger. Bigger bulbs will produce bigger blooms and can be more vigorous growers. Unfortunately, the time required for a bulb to reach this level of maturity also requires an increase in price. Therefore, what you really need to consider is the manner in which you will be planting your bulbs to determine if spending more for larger ones will be worth it. Are you planting a small group of 10 bulbs or a mass of 100 or more? If you want smaller clumps, you will want to use the top size bulbs. On the other hand, if you plant in mass, you could settle for the smaller bulbs. Most bulbs are measured by their circumference (distance around the entire bulb) of the widest area in centimeters. There are minimum acceptable sizes and then what is considered ‘top size’ bulbs. To determine just how large the bulb is you are considering, it is helpful to convert the centimeters to inches. For example, 10 cm would be approximately 4 inches around, 12 cm would be about 5 inches, and 16 cm would be just over 6 inches since 2.54 centimeters make up one inch. Here is a simple chart showing minimum to top size for flower bulbs. 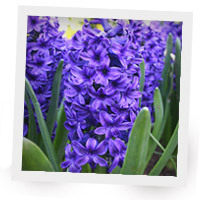 I have just a few other notes regarding the impact of bulb sizes: Hyacinths that are larger than 15/16 cm will tend to get too tall and fall over. Some bulbs easily naturalize (Asiatic, Oriental, Daffodil), so when planning a garden it may be wise to purchase a smaller quantity to allow for adequate spacing. Spruce Up your Garden with Art! Garden Art. Most people are usually on one side or the other: love it or hate it. I would be on the “love it” side – with some boundaries. Some people get carried away with garden art. Some can make it look more like a garden rummage. When done right, it can be the icing on the cake, a great accompaniment to your well-tended landscape. I have a fellow friend and blogger, Vanessa, who has quite a lot of garden art. I really like each of her selections, just not quite so many. (I do not consider her yard a rummage!) In the past, I have been very selective on what I put in my flower gardens. There are a few things to consider when choosing to add garden art to make it the finishing touches to your yard. First, choose items that fit your sense of style. These items can be bought, recycled/upcycled, or even found. Style/feel options can range from: cottage, quirky, farm, whimsical, holiday or rustic. Secondly, they should blend or pair with something else in your garden. Consider a sculpture of cattails if you have a water feature, or a whimsical piece placed near airy plantings. Lastly, proportion is to be considered as well. Don’t put a tiny decorative metal bird in a mass planting where its “adorability factor” would be lost or a large piece that distracts your eyes from the beauty of the rest of the garden. Other things to think about when looking for pieces to add to or accentuate an idea or feeling would be sound, color, focal point, structure, and even mementos. Structure ideas would be an archway, partition, decorative section of fence, or a bench. For sounds, there are bird recordings, water features, or wind chimes. Be selective and add one piece at a time. If you love your flower gardens, adding garden art is just the finishing details to your “room” to make it more complete. I have bought an inexpensive bird bath and decorated it with colorful tile chips, a wrought iron dragonfly, a few wrought iron finial towers to add more interest in fall and winter, colorful pots for my deck, a sundial, and whimsical metal farm animals for my vegetable garden- just to name a few. Check out some websites like Willard & May, Garden Art, or Etsy for some good ideas. You can also find some nice local artists selling unique items at your local farmers markets or fairs. The most trendy and popular items right now for decorating outdoor rooms are durable, like metal, water features, many, many things from recycled items, outdoor paintings and lots of COLOR. So, go for it. Don’t be afraid, begin to put the finishing touches on your outdoor room decorating! Posted in Flowers, memorial	| Tagged color, focal point, functional, Garden art, memento, recycled, sound, style, upcycled, Willard&May, yard art	| Comments Off on Spruce Up your Garden with Art! I often pick my ‘browning’ Allium Purple Sensation and stick them in all my containers at varying heights. It adds some interest to them while my later summer blooms are still growing to maturity. This year, I decided to cut my Allium Globemaster stems once the purple color had faded away to make an arrangement display to keep inside. I bought green, silver, orange and purple spray paint. I painted the stems green. I sprayed 4 balls purple and they look just like fresh Allium! I tried painting one ball silver, but it looked too dull. I then painted 3 other balls orange. I went to WillardandMay.com to check out their pottery! They have some fun pieces! I settled on the rough brown pot. I stuffed some bubble wrap in bottom to help hold each stem in place. I think I am going to add some krinkle paper to fill in container. This will be a nice addition to my entryway at home. Well, that is if I ever take it home from my office.